This is a relatively easy National Waymarked Trail taking you 117 km over 5 days from Lucan Road Bridge in Dublin to Shannon Harbour in Offaly. 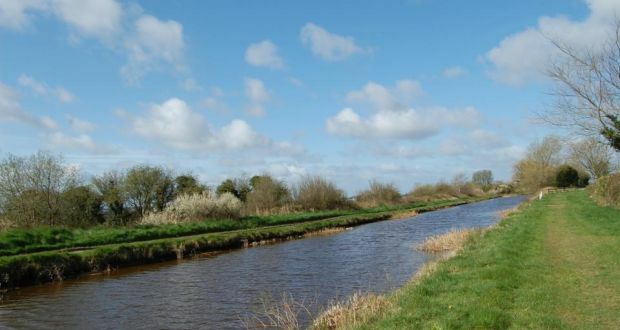 The Grand Canal Way follows pleasant grassy towpaths, gravel and sometimes tarmac canal-side roads from Lucan Bridge near Adamstown in County Dublin 124km to Shannon Harbour on Irelands longest river. The route is an informal linear park punctuated by the locks that characterise canal technology, carefully restored surviving lock-keepers cottages, and the towns and villages whose existence is owed to the trade and commerce the canal brought in the 18th and 19th centuries. Much of the landscape through which the route passes has been untouched by modern agriculture and remains a linear oasis for the flora and fauna that was originally common throughout our countryside. The many towns and villages along the way provide walkers with accommodation possibilities along the route, and as public transport options are good, these places can act as starting and finishing points for those who want to sample only sections of the route and discovering on the way the scenic towns and villages of Ireland on the Waterways. Ferbane is a good starting point for the Monastic Way, only eight Kilometers northeast on the Ballycumber road lies Lemanaghan with its remains of a Romanesque church or if you like the outdoors visit the nearby Lough Boora Parklands which host some of the most innovative land and environmental sculptures in Ireland. Visit the quiet walkway along the Grand Canal. This superb waterway travels from Dublin and joins the Shannon near Shannon Harbour. Enjoy the serenity of its surroundings and the aquatic plantlife and wildlife on its banks. The River Brosna too provides a relaxing walk. Because of the proliferation of old monastic sites along its banks it was known in ancient times as Abha De, the River of God. situated in both Offaly and Laois, the picturesque Slieve Bloom Mountains allow visitors to experience and to explore the largest continuous area of upland blanket bog and forestry in Ireland. Mountain streams and waterfalls run into deep wooded valleys and friendly villages nestle at the foothills. Trees, shrubs, heather, bog mosses, bog cotton and other vegetation, as well as wild forest animals and insects, surround the mountains and offer a great experience to the leisurely stroller or energetic hiker. 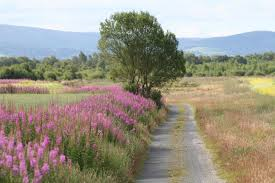 Choose from a variety of walks; eco trails, short and long loops, forest paths and the Slieve Bloom Way. 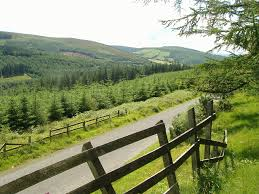 Over the last four years both Offaly and Laois County Councils have launched a series of new walking routes in the Slieve Bloom Mountains and we invite people to take a trip up the mountains where you will be pleasantly surprised by what you find. This was facilitated by the help and support of local landowners and farmers. Check out www.slievebloom.ie for further information.